Home/Forums/Support/TurnKey Configuration Console, Caught Exception - After restore to fresh install. Traceback (most recent call last):? ?File "/usr/bin/confconsole", line 470, in loop? ?File "/usr/bin/confconsole", line 225, in usage? ?File "/usr/bin/confconsole", line 141, in? ?File "/usr/bin/confconsole", line 135, in _validip? ?File "/usr/lib/confconsole/ifutil.py", line 233, in? Though we're able to reach our wordpress sites, this error on the console is a little bit of a concern. Do you have any modifications to what TKLBAM includes? I don't recall, but I wouldn't have thought that TKLBAM would include networking info by default (at least it shouldn't IMO). I'm unsure, exactly what you mean as to any modifications. Basically installed a new TKL Wordpress version. And ran tklbam-restore. I manually set our network interfaces before doing the restore and got this error. I also tried restoring without adding all of our network interfaces, and the same thing occurs. Ie did you run a default backup or did you customise your backup and include additional files? If not I've got no idea. My backups work ok last time I tested (although perhaps I should test again? I did not modify the backup, it was just a fresh install of wordpress and a tklbam-restore then this error pops up. Just looking for what this error even means to be honest and any suggestions on how to resolve. And can't say I've ever encountered this issue. Obviously it's not ideal, but I wouldn't worry too much seeing as everything else seems to be working. When referring to your backup I meant at the time you created the backup; whether you ran the default backup or whether you tweaked the TKLBAM backup config (or used switches etc) to include additional files/directories/etc in your original backup. I was guessing that perhaps you have included something in your backup that ideally shouldn't be there and is overwriting something it shouldn't when you restore (and thus breaking confconsole). I'm unsure, I was just placed in charge of managing a few TKL boxes at random. I'm not sure if anything was modified to those backups. But thank you greatly! 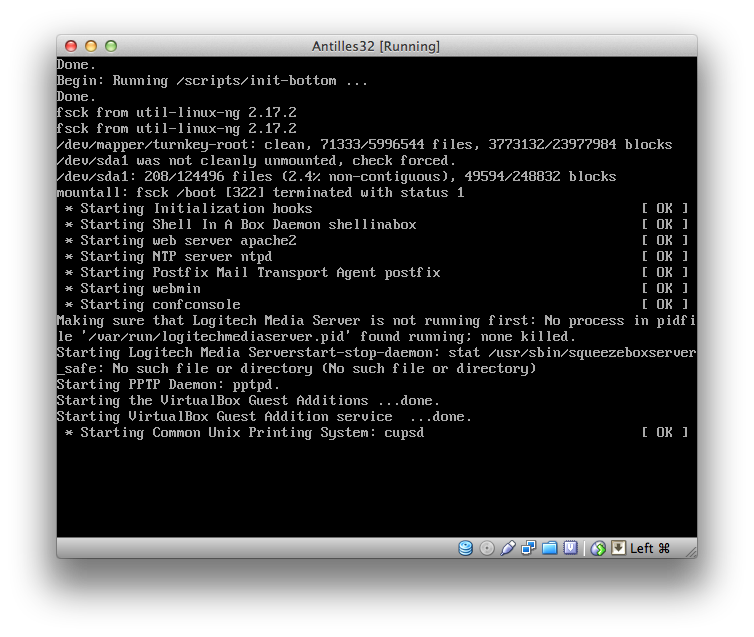 Removing and installing the confconsole worked. But by the sounds of things I suspect that there are files included in your backup (that have been added by the previous maintainer) that ideally shouldn't be in there and that is where your problem has occurred. Personally I'd be inclined to run a fresh backup and test it. Yeah, just ran in to the exact same message, though I know how it happened, I'm not sure how to fix it. because each time I started, ConfConsole said Networking was not set up. It was trying to configure eth2, which I have on the motherboard, but it's not configured (nor is there a LAN cable plugged in to it), so I wanted it to use eth0, and thought this might force the issue... Except the only issue it forced was the same error. See screenshot of stuck confconsole. Hitting < OK > simply returns to the same screen. Now it's stuck. I can hit F7 to get out of confconsole, but I don't have a command line as it appears to be stuck during the startup. See screenshot. What do I have to do to get to a command line where I can repair the confconsole.conf file? Hit [ Esc ] at stuck ConfConsole. Asked if I really wanted to Quit? Ya, sure, ya betcha. Command prompt.